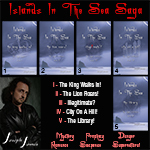 Islands In The Sea: Saga (5 Book Set) ** Christmas Special [IITSSAGA] - $55.96 : Beneficial Zone, Everything is permissible, not everything is beneficial! Get the complete 5 book saga for a wonderful savings. (Retail Value $69.95) Get ready for book 5 as Joseph continues to add books to the saga. What is going to happen to the team this time? They've been through four major series of events together and it's only brought them closer, but evil doesn't give up. *** SPECIAL: Get 5 Books for the Price of 4! Book 5 is now in Pre-Press. Book 5 will ship as soon as it is published! Get one set for yourself and some for your friends as well. It is a great series of encouragement and hope. Dream again! Be sure to buy an extra set or two for friends and family. They make great gifts.